When you think of traveling in Africa, what do you picture? Do you picture luxurious hotels and game lodges, wine tastings, gourmet food, and wildlife-filled safaris? That's definitely one way to see Africa – and, in fact, that's more or less the way my dad and I decided to experience South Africa. But the opposite is also an option: sleeping in tents in the African bush, meals cooked over a campfire, and traveling around in a giant truck instead of private vans and planes. Both ways are great ways to experience Africa – but the experiences themselves are of course very different. 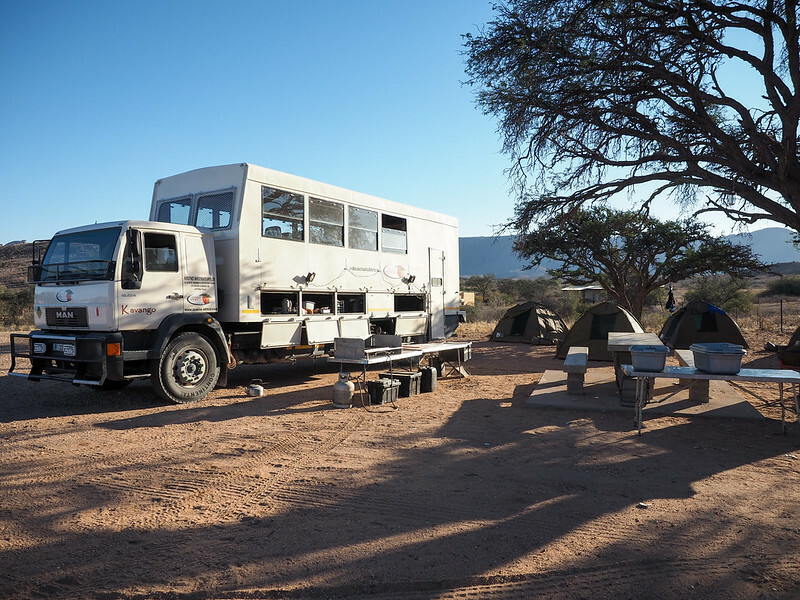 Since I was doing a luxury trip in South Africa with my dad, I wanted to make sure to experience the other popular form of travel in Africa, too: the overland trip. What is an overland trip? While I'm not sure if that's entirely true (I don't think there's any “right” or “wrong” way to experience any destination), I can't deny that overlanding in Africa was something that I was dying to do. Nevermind that I'm not a camper and really like my daily hot shower… I knew I couldn't leave Africa without trying it. You've probably heard of the Grand Canyon, which is one of the largest canyons in the world. But have you heard of Fish River Canyon? 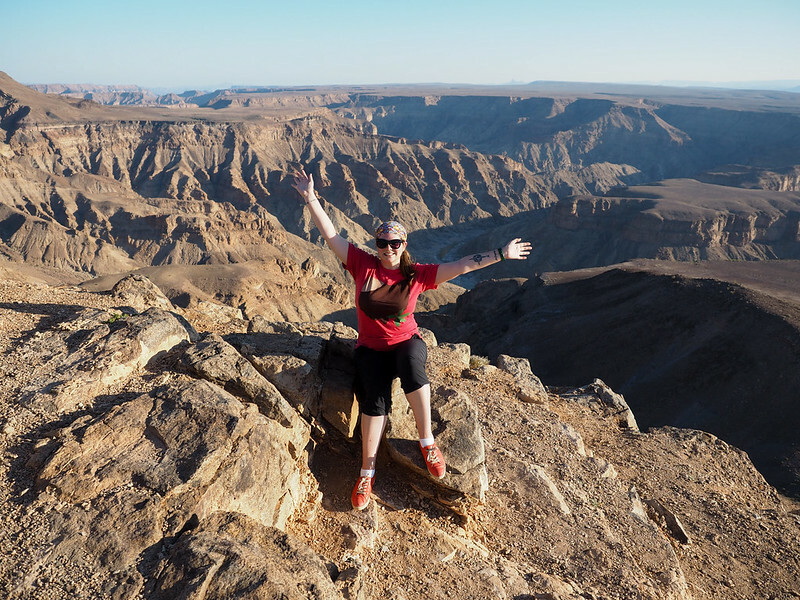 Located in Namibia not far from the South African border, this is the largest canyon in Africa – and also one of the largest canyons in the world, with a depth of more than 1800 feet and sections that are 17 miles across. The best part, though? Unlike the Grand Canyon, Fish River Canyon isn't flooded with people. In fact, when my group visited one evening for a short canyon rim walk before sitting down to watch the sun set, we were essentially the only ones there. 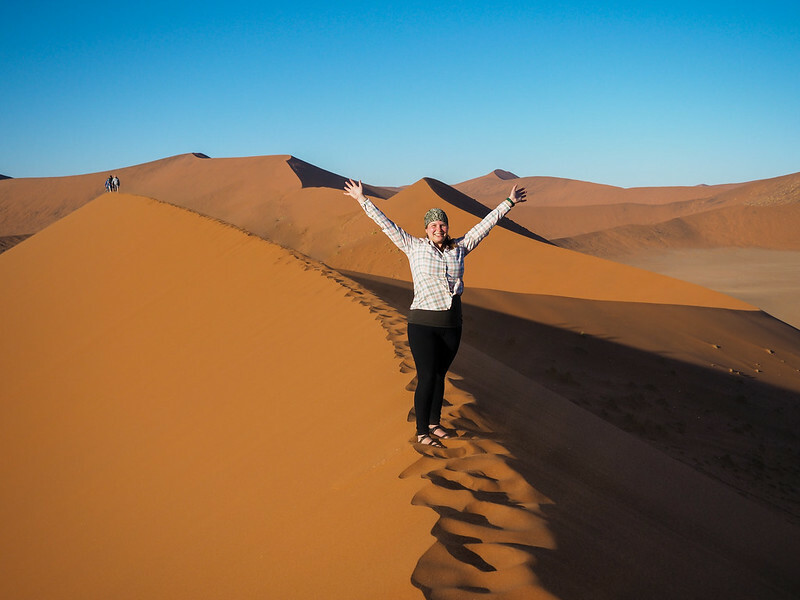 Part of the reason I wanted to visit Namibia so badly was because of my desire to see the famous orange sand dunes of the Namib Desert. And boy did I get my wish! We woke up at 4:30 a.m. in order to get to the Sossusvlei area of Namib-Naukluft National Park before the gates opened, meaning we were some of the first people to ascend the famous Dune 45 as the rays of the morning sun were turning it bright orange. This is NOT an easy climb (and you will most definitely get sand everywhere), but it was definitely worth the effort. Another part of the Namib Desert that I looked forward to seeing was Deadvlei, a clay pan surrounded by towering orange sand dunes and filled with the spindly black trunks of dead desert trees. We visited Deadvlei directly after our Dune 45 climb, making for an epic day of sand and sun. I'm definitely not a camper. In fact, before this trip, I had maybe spent a grand total of two nights sleeping in a tent. But there's something magical about camping under the stars in Africa, and this was hit home for me at a campsite in the middle of nowhere in Namibia. Surrounded by towering sandstone formations, we cooked over a campfire and admired the Milky Way above our heads at our Spitzkoppe camp. I didn't even care that we had no access to electricity or running water. The wildlife is often the star of a trip to Africa, and nearly every overland trip will include at least a few game drives in various national parks. Our first set of game drives were in Etosha National Park in Namibia, where we saw huge herds of zebra, plenty of elephants and giraffes, and even a few lions. How many different types of animals can you spot in this photo?? We also stayed at a great campsite right in the park that had its own watering hole that was floodlit at night – perfect for spotting rhinos! Going to the Okavango Delta is the reason that a lot of people visit Botswana. It's a unique ecosystem that changes with the seasons, and you get there by traditional mokoro canoes. My group stayed overnight in the Delta at a mobile tented camp, which meant we got to explore a bit on foot (and be terrified by the sounds of hippos way too close for comfort at night). The next morning, I also did a doors-off helicopter flight over the Delta, which was incredible way to get a sense of just how vast it really is. My favorite campsite of the whole trip? I think it had to be Elephant Sands in Botswana. When it comes to wildlife, elephants are definitely the most dominant in Botswana – there are tens of thousands of them! And at Elephant Sands, you're guaranteed to see plenty up close. The camp has no fences or barriers, and has one man-made watering hole at its center. Dozens of elephants (maybe even more) come here every day for a drink, meaning you can sit sipping a drink or be lazing in the pool just feet away from them. It literally felt like I could reach out and touch them! My other favorite game drive of the trip was the boat safari we took in Chobe National Park in Botswana. We did a land-based game drive here, too, but it was definitely the boat safari that stole the show. Not only did we get to enjoy cruising down the Chobe River, but we got to get up close to things like big pods of hippos and swimming elephants! Have you ever seen an elephant swim? I have! My overland trip ended in Livingstone, Zambia, near the world-famous Victoria Falls. I had already visited the Zimbabwe side of the falls with my dad, but the Zambia side was just as cool. We got soaked crossing the Knife-Edge Bridge thanks to the falls' heavy mist, which was so much fun. Others in my group did things like bungee jumping and white water rafting at this stop, but since I'd already been gorge swinging and up in a microlight over on the Zimbabwe side, I just enjoyed seeing the falls for a second time. 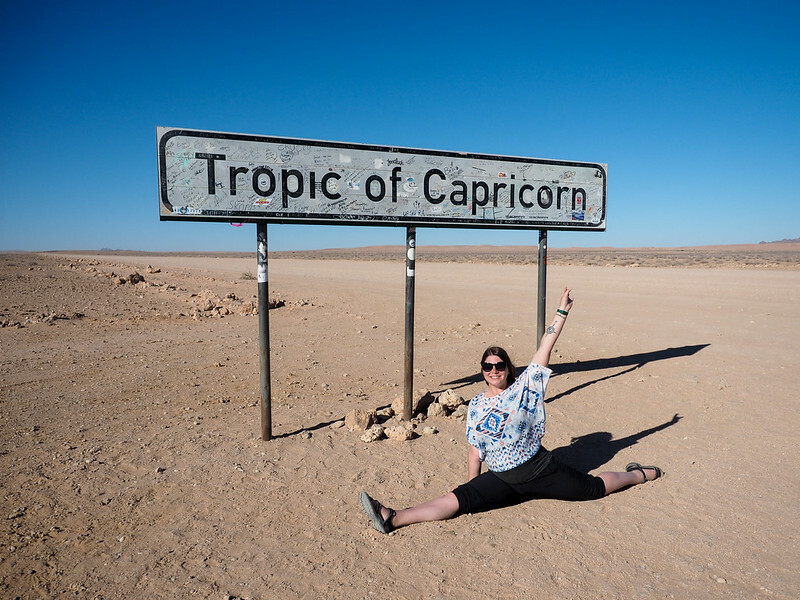 There were plenty of other memorable moments during this trip, too – like taking silly photos at the Tropic of Capricorn and binging on seafood in Swakopmund – but these were definitely my personal highlights! 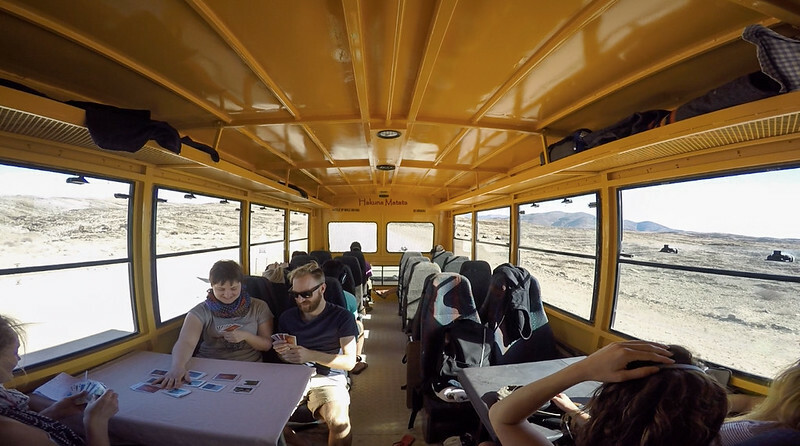 Have you ever been on an overland trip? What you you like to read more about? *Note: I received a discount on my Desert Tracker tour with Acacia Africa. But, as always, all opinions and oversharing of wildlife photos are 100% my own! It’s rare that I’ll see a trip and think to myself “I want to go on that EXACT trip” but my goodness, I want to go on this EXACT trip!! Well that’s pretty awesome to hear! I’ll be writing more about my Acacia trip soon (including answering all the questions people have asked me about it), but I can say that it was amazing – way better than I expected it to be! It really is one of the best ways to see these parts of Africa. This is so interesting! I am curious as to costs and how easy/hard it is to get to and from the tour itself.. Also, when camping out in the wild, besides getting hippos and elephants up close how was the insect/creepy crawlies situation? I’ll definitely cover the costs in my post about the tour, but this is one of the more affordable ways to travel around Africa. The tour I did runs $1500-$2000 per person + an extra $375 to cover some of the activities. Not really too bad, considering that covers everything for nearly three weeks! And flights to South Africa (from the US) were about $1400, though that’s on the higher end of the price range. And we didn’t have any problems with bugs! I think traveling in the winter helped with that (and we were warned about scorpions in a few places), but we never had one bug in our tent. Btw, your wildlife shots are so amazing! And thanks! I bought a new camera lens just for the wildlife on this trip, and I’m SO glad I did! This looks AMAZING! 🙂 I’ve never really considered an overlanding trip in Africa but I think you’ve just sold it to me! I’m glad to hear that! I honestly wasn’t sure how much I would enjoy it, but I ended up really loving it! This trip looks amazing – especially with all the wildlife and the stargazing. I’ve always wanted to see the Milky Way in it’s full glory. However, how to do you avoid mosquitoes on an overlanding trip? I feel like they would be a huge problem. Can’t wait to hear more about this trip! Wow, this looks just incredible! I’m doing an overland trip in a couple of months and visiting all of these places so it’s great to see what’s in store! I love how close you are to the animals and the early morning sand dune picture is awesome! 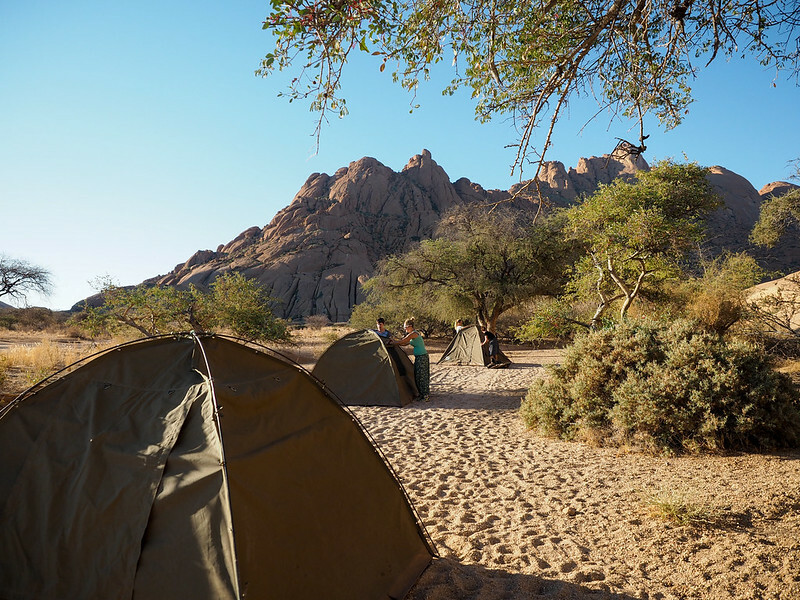 The tents that Acacia (and a lot of other overland companies) use are SUPER easy to put up and take down. Less than 5 minutes once you’ve done it a couple times! So fabulous. I love the photo of all animals at the watering hole. I counted 5 how many were there??? The sand dunes were awesome. Kind of scary to see how tall they were the trees. You know more i read about you all in this travel blog, I feel more i belong to this family. Yes, I am also been bitten with traveling bug, as they say you are never to old to travel as you heart is always young for exploring. Thank you Akatuki for showing the other option of traveling. Keep your spirit of adventure coming. Take care and look out for my blog in its infant stage. Actually, many people are too old for the Acacia tour. It is limited to those under 39. Disappointing to this 58-year-old marathon runner. Looks like a great trip. I’m not sure that they wouldn’t let you do it, though. 18-39 is the “recommended” age for these trips. If you’re interested, it’s probably worth ing them and inquiring about it. It’s a great way to see Africa! I’m sure I’ll do another one at some point – I still need to visit places like Tanzania and Kenya! Africa is a beautiful continent to visit, but is it safe right now?? I don’ t think so. Well, considering I just spent 5 weeks traveling in Southern Africa, yes, I do think it’s safe right now. I wouldn’t be going to, say, Lybia anytime soon, but Lybia is 4,000 miles away from South Africa. Remember that Africa is HUGE and can’t be painted with one brush stroke. Hey there! Thanks for sharing your experience with this overland trip – it seems like you got to have some pretty phenomenal experiences along the way. Also, your photos are great!! The Namib Desert looks really incredible. Which is why I was a bit confused by mentions of “experiencing Africa” and “overlanding in Africa” (for overlanding specifically, is this something that is actually done throughout the entire continent?) Perhaps it seems like I’m nitpicking, but it’s a comment stemming from genuine curiosity. And also the belief that, as white travel writers (and especially white travel writers writing about Black and Brown cultures), we should be very intentional about our languages choices, so as not to homogenize other cultures in any way. I’m curious to know your thoughts. Sorry about the long comment! Hey Alissa! I understand where you’re coming from. I chose to go with Africa over Southern Africa because I didn’t want people to read it incorrectly as South Africa (I already wrote a post about highlights just from the country of South Africa), which would be easy to do, especially when I know many people only half-read titles on social media. And listing all the countries is just too much for a blog post title. And as for the comments about overlanding Africa as a whole, yes, this IS something that is nearly continent-wide. I have friends who overlanded from Cape Town to Cairo, and a handful of people on my trip were continuing on on the same tour all the way to Nairobi and into Uganda. I just chose to stick to the 3-week itinerary. I totally agree that a lot of people tend to lump all of Africa together – that wasn’t my intention here, though. Good for you! I slept outside once in the Australian Outback and it was so not my thing! Haha well I still wouldn’t say it’s my “thing,” but it was worth it! I won’t be rushing to do it again right away, but I at least know now I CAN do it! ‘Looks marvellous. I’ve never been to either Namibia and Botswana, but what an adventure that would be! I’m not one for roughing it too much, although somehow I seem to have done a lot of camping in the rain, with my son who was in the Boy Scouts of America (we were the only British people in the troop)! Funnily enough, I’ve also done quite a bit of music festival camping. Also in the rain! But if I had a choice, I probably wouldn’t camp at all, as I prefer stylishly glamping, or just stylishly drinking cocktails somewhere else lol! Was it awfully rough? And were you scared of the closeness of the animals to the camp? It wasn’t actually too rough at all – all the campsites we stayed in were super nice with flush toilets and (usually) hot water showers, along with things like bars and pools. I’ve heard it gets much more rough when you get up into East Africa, but the camps in Southern Africa really surprised me! There were also options to upgrade in a lot of campsites for an additional fee. As for being close to wildlife, most of the camps we stayed in were gated/fenced, so it was only an issue maybe 2 or 3 nights! Looks like you had so much fun! Love your photos, May I repost this article on my website to share with my readers? I would love to link back to you! Thanks! Hi Kally! Yes, I had a great time. But no, I would rather you didn’t repost this on your site – it’s not good for either of our sites in Google’s eyes to have the same content.